Aquaria’s story begins rather tentatively. At first, you’re treated to a British-voice actress’s pretentious monologue about fate, and then you meander through some pretty caves; you get to admire both the visual style of the game and the pleasing soundtrack. But just as Aquaria begins to resemble an interactive art installation, a mysterious figure appears and teleports you into a seeming dream world where you first control the dark “energy form” of Naija. This sequence is a clever way to foreshadow the later, more sinister tone of the game and give the player hope that the character will not always be such a pacified Little Mermaid knockoff. Instead, Naija’s powers become darker and more potent throughout the game. Initially, she can only swim, summon a speed burst, and sing. The “sing” interface is a clever design conceit that allows Naija to interact with certain environmental factors and cast magic. Eventually, Naiji will learn to transform into different forms that vary from a close-combat style beast form to an evil-looking energy form that grants Naija the ability to blast enemies with bolts of magic. Not only can you obliterate the alien-looking armored foes you encounter, but helpless schools of fish as well. You’ll also gain access to different costumes, pets that will aid you in battle, and other allies. The level design favors labyrinths and discovery over linear stages. Each successive level carries new dangers and different challenges, and for a game based purely underwater, the environments are remarkably varied. You’ll get to explore abandoned cities, kelp forests, and a corrupted cathedral that resembles a Castlevania stage crossed with the stomach of a whale. Pretty spooky. There are many moments in the game where you truly appreciate how well it is crafted. The soundtrack alone is one of the catchiest I've heard in a while. Some of the later areas are shrouded in darkness and Naija must use her body like a flashlight to see the way—a clever way to spice up gameplay. The bosses resemble old school monsters and boss battles require you to use a variety of the skills you’ve learned. The sea creatures are diversified and numerous throughout the stages, and there are some cute details too: when you journey towards the surface, you can hop out of the water and knock monkeys out of their trees... and then watch them drown. As clever as Aquaria is, the game was made on a relatively small budget. The voice acting worked for me, but the writing follows the predictable “arrogance sunk Atlantis” pattern. And while the retro graphics and style were great tributes to a bygone era in gaming, the death sequences are a bit hokey. The map system was probably my biggest frustration with the game. 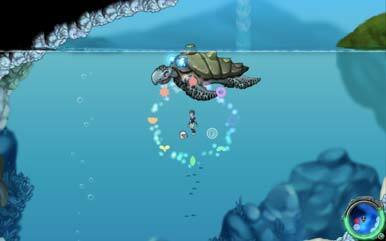 Instead of having linear stages, Aquaria follows the adventure format and has lots to explore. The map has little icons depicting where you should go next, but I found them next to useless and basically used trial and error to figure out what I could explore next. The game’s long play time ensures a rewarding experience, but I had some agonizing minutes retracing my steps to see if there was some new passage I could access. The game doesn’t merely pay homage to an earlier genre of gameplay, but embellishes and explores new ways to define it. 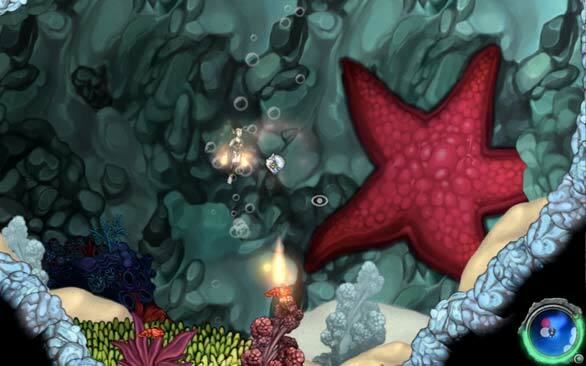 Aquaria’s vast oceans require hours to explore and even then you’ll likely want to retrace your steps to find the little treasures you missed the first time around. Well-paced and unique, Aquaria is an instant classic.